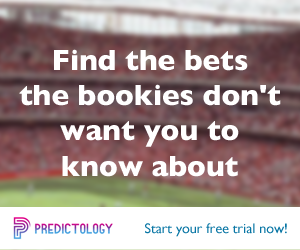 With access to over 200,000 matches, spanning 22 of the top European leagues and over 100 different variables and data points, Predictology puts at your fingers the ability to create powerful and complex betting systems, develop your own portfolio of betting strategies as well as the ability to quickly create multiple micro betting strategies. You can learn more about the importance and benefits of micro betting strategies in this blog post. Then each Friday we share we with you some of our micro betting angles and the selections generated for the weekend ahead by these micro betting systems. We’re starting this week with an interesting pattern involving one of Europe’s best defensive teams, Atletico Madrid. Over the last 6.5 seasons, backing Atleti to follow up a loss with a game that features under 2.5 goals would have yielded a 26% ROI, that’s from a 69% win-rate. They’re trying to bounce back from a defeat at Sociedad with an away day at Alaves this weekend and under 2.5 goals is priced at 1.5 with Bet365. Whilst Atleti are famed for their defensive aptitude, Dortmund are perhaps better known for their attacking prowess. And they often seem to be in the mood for goals following defeat, which they are this week. Indeed, over the last 6.5 seasons, they’ve followed defeat by playing in an “overs” games a whopping 82% of the time. That number rises to 100% of the time if focusing on this term alone. Marathon Bet have priced O2.5 Goals at 1.61 which is a very appealing offering, all things considered. Premier League data crunched from the last 7.5 seasons shows that teams on a run of four or more without a win are able to turn around the form 43% of the time. Southampton are winless in their last nine at home but will take confidence from their record against Bournemouth. In fact, Saints have never lost at home against Bournemouth (eight wins, five draws). The Cherries haven’t managed a goal in their last five visits to their south-coast neighbours either. Bet Victor have the home win priced at 1.75. To La Liga now and the Over 2.5 Total Goals market. In Spain, when sides are on a run of three or more games that have seen under 2.5 goals, there is a straight 50% chance that the line will be passed on their respective next outing. That’s based on 6.5 seasons of data. Eibar’s fans haven’t been treated to many goals recently, or wins for that matter. They have only prevailed once in their last five, and none of those games have seen more than two goals scored. They face a visit from fourth place Valencia this weekend who have seen O2.5 in two of their last three. Picking this game to finish on the high side of the line is priced at 1.85 with Matchbook. On the same market, Betis haven’t seen many goals at either end of late, but they might expect that to change against bottom club Malaga this weekend. Malaga have only managed 20 points this term and have a goal difference of -29. Over 2.5 Goals here is 1.8 with Bet365. Back to the Prem now, and two of the division’s more frugal outfits (with regards to goals, that is). Neither Everton or Huddersfield have played in a game with over 2.5 goals in the month of April, that’s 540 combined minutes of football. But data crunched from the last 6.5 campaigns shows that top-flight English clubs who’ve gone three or more seeing less than 2.5, go on to play in an over 2.5 game, 54% of the time. With that in mind, 2.7 on that particular selection looks an appealing price and one that you can get with Marathon Bet. In Italy, sides playing in low-scoring games – specifically three (or more) of under 2.5 – go onto break the 2.5 line 45% of the time. That percentage relates to this season, but if you crunch data from the last seven the number rises to 52.7%. Bologna v Milan is a game that ticks the requisite boxes for this system not once, but twice. Milan haven’t breeched the line in five games, whilst Bologna haven’t in eight. Based on the stats mentioned before, they are defying the percentages at the moment which makes Bet365’s price of 2.04 an appealing one. This entry was posted in Betting systems, Betting Tips, Micro Betting Strategies and tagged betting tips, betting trends, free betting system, free betting tips, micro betting angles, micro betting strategies, predictology. Bookmark the permalink.